Mirror, Mirror, on the Wall, Which Nation Has the Biggest Welfare State of All? When I think about social welfare spending, I mostly worry about recipients getting trapped in dependency. But I also feel sorry for taxpayers, who are bearing ever-higher costs to finance redistribution programs. Today’s column won’t focus on those issues. 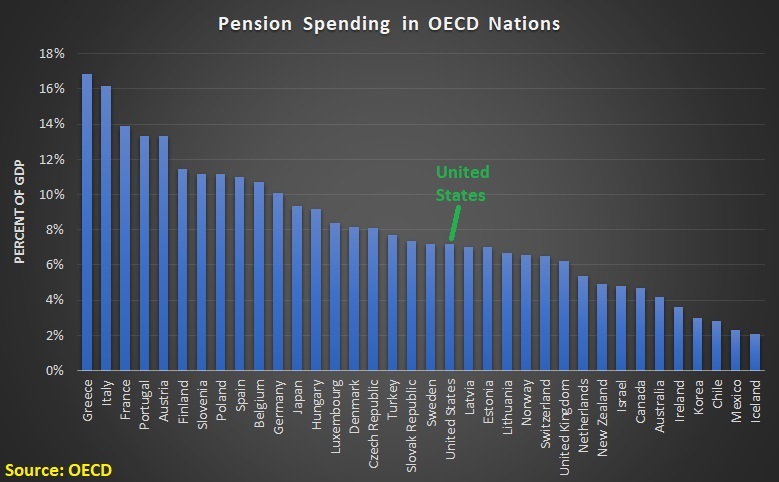 Instead, we’re going to utilize new OECD data to compare the size of the welfare states in developed nations. We’ll start with the big picture. Here it total redistribution spending, measured as a share of economic output, for selected countries that are members of the Organization for Economic Cooperation and Development. 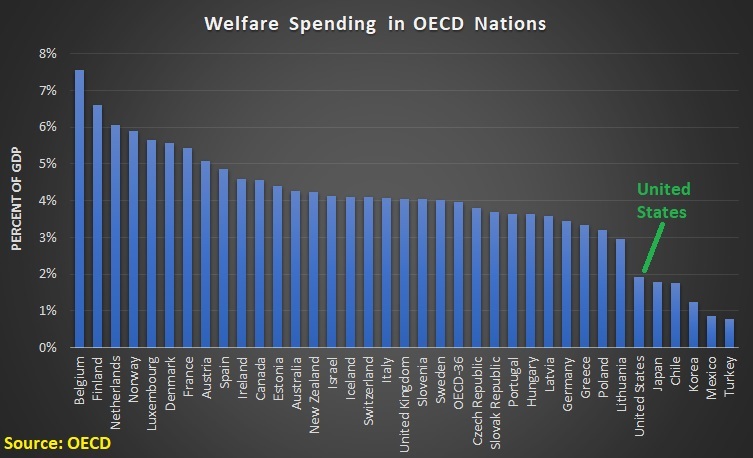 Nobody will be surprised, I assume, to see that France, Finland, Belgium, Denmark, and Italy have the biggest welfare states. The United States is in the middle of the pack. American taxpayers might be surprised to learn, though, that they finance a bigger welfare state than the ones that exist in Canada, Iceland, and the Netherlands. The overall numbers are important, but it’s also educational to consider the various components. And the largest chunk of social spending in most nations is for their old-age programs. The biggest burdens are found in Greece, Italy, France, Portugal, and Austria. The United States, once again, is in the middle of the pack. By the way, keep in mind that there are many factors that determine why some nations spend more than others. How generous are benefits? – This is often measured as the “replacement rate,” which compares retirement benefits to income during working years. When can people retire? – Some countries allow people, or some classes of people, to get benefits while relatively young. Others are more stringent. Does a country have an aging population? – Demographic changes already are beginning to have a large effect on the finances of some systems. Is there a private savings system? – Nations such as Switzerland, Australia, Chile, and the Netherlands have significant private retirement savings. 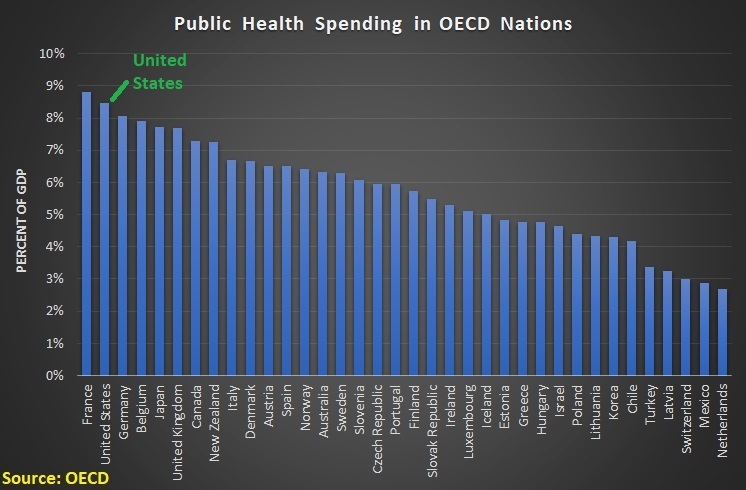 Now let’s look at government spending on health. Here’s the area where the United States is more extravagant than almost every other nation. Only France spends more money. Actually, since per-capita GDP is significantly larger in the United States than in France, American taxpayers spend more on a per-person basis. Some people will observe, with great justification, that the data for the United States may be a measure of the inefficiency of the American system rather than taxpayer generosity. This is a topic for another day. Last but not least, let’s look at traditional welfare. In other words, cash assistance to the working-age population. The fiscal burden of this spending is highest in Belgium, Finland, the Netherlands, Norway, and Luxembourg. The United States, meanwhile, is comparatively frugal. P.S. Here are a couple of caveats for number crunchers and policy wonks. First, there are methodological challenges when comparing OECD nations. Eastern European nations tend to be significantly less prosperous than Western European nations, thanks to decades of communist enslavement. So looking at this data does not really allow for apples-to-apples comparisons. Moreover, there are a handful of developing nations that belong to the OECD, such as Mexico and Turkey, so comparison are effectively meaningless. And Chile is on the cusp of becoming a fully developed nation so it’s in its own category. Second, as I briefly mentioned above, nations have different levels of per-capita GDP. If we look at the last chart, Austria and Spain spend a similar share of GDP on welfare, but since Austria is a richer nation, its taxpayers actually finance a lot more per-capita welfare spending. The same is true if you compare Canada and Estonia, Sweden and Slovenia, and Germany and Greece. P.P.S. There was virtually no welfare state in OECD nations prior to the 1930s and very small welfare states until the 1960s. For what it’s worth, the huge reduction in poverty in those nations occurred before the welfare state. on April 11, 2019 at 12:35 am Socialismo en el mundo moderno, parte IV: el estatismo francés. These OECD Health expenditure figures are wrong. See link below. PPPS: I haven’t diagnosed this specific OECD report. 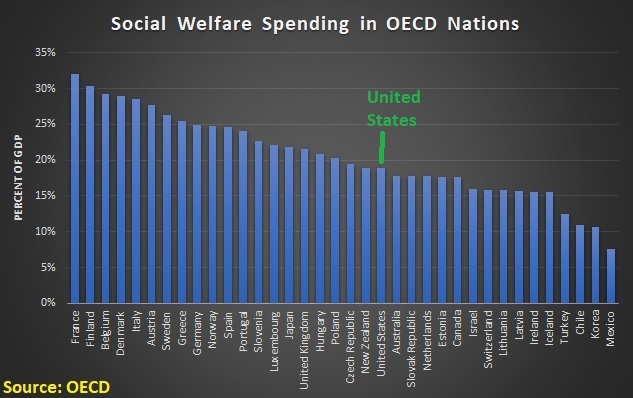 If it follows the methodologies of similar ones they do and given the specific numbers they report here, the USA’s low position on welfare spending share of GDP is largely because the USA has a large proportion of its welfare payments classified as “non-cash” — such as food stamps and public housing. These are not counted for the USA, but are for other countries, either because they are organized differently or they don’t define “cash” as narrowly as the USA does. In the past, correcting for that problem puts USA in mid-pack as in other indicators.